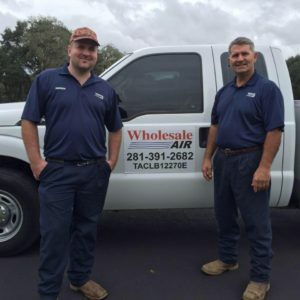 Wholesale Air is a family owned and operated air conditioning and heating company that has offered quality service to the Katy and surrounding areas since 1991. We strive to serve our clients with experience and integrity. Any time I call Wholesale Air to service the A/C at any of my 5 houses, they are at my house that day or the next! Great Attitude and they get it done fast! Honest, ..... thinks of customers needs first. I recommend people that I have used myself. I am a property manager for a dozen homes in the Houston area. I have been using this company for many years. Their services, pricing and integrity are sterling. Get these guys to check out your system. They’ll always shoot straight with you and do the right job. If you need any work done or your unit checked, these guys are the BEST! Hallelujah! Thanks so much. A/C fixed this morning by Wholesale Air (great guys). Cool air is coming in. Wholesale Air has been so good to us over the years. I highly recommend them. We have been using Wholesale Air for our heating and air conditioning needs for several years. We have always been serviced promptly and with fairness. Thank you for all you did to get our A/C & Heat working properly again. You were so kind to come to our rescue. Thanks for all the “extras” you included to make our system run better. We so appreciate the quality and integrity of your work. Thank you as well for exceeding the original scope of work, within your bid amount, by adding additional air returns when you felt it was necessary. heater that morning. A great job, very courteous and professional. Thank you for being so prompt, efficient and trustworthy! We appreciate your service. We are grateful to have you on our side.